The Strong National Museum of Play in Rochester, also known simply as The Strong is a collections-based history museum devoted to playing. Established in 1969 and one of the country’s largest and premier family-orientated institutions, The Strong® is dedicated to the role of play in learning and human development, along with the way that play has contributed to cultural history. The Museum houses the world’s most comprehensive collection of materials, both historical and modern, related to playing that has been adapted to cater for audiences of all ages. The Museum is also home to the National Toy Hall of Fame, the International Center for the History of Electronic Games, the World Video Game Hall of Fame, the Woodbury School, the American Journal of Play, and the Brian Sutton-Smith Library and Archives of Play. Together, these centers and institutions offer an array of multifaceted exhibitions, educational activities, interpretive and research-based programs for all ages. The National Museum of Play, formerly Strong National Museum of Play and today, just known as The Strong® was founded in 1969 by Margaret Woodbury Strong, whose personal collection of materials formed the basis for the Museum’s first exhibition. 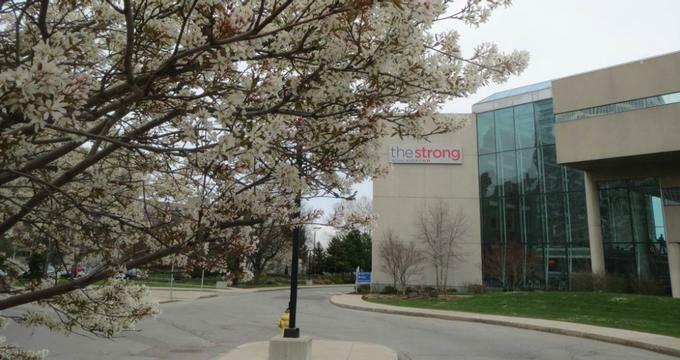 The Strong® was opened to the public in 1982 and has since been expanded twice to cater for its ever-growing collection and now spans over 282,000 square feet in size. In addition to hundreds of thousands of items related to play and its history, The Strong® also feature five play-partners, namely the National Toy Hall of Fame, the International Center for the History of Electronic Games, the World Video Game Hall of Fame, the American Journal of Play, and the Brian Sutton-Smith Library and Archives of Play. The National Museum of Play is a collections-based history museum with the interactive characteristics of a children’s museum that is devoted to the art of play. The Museum’s comprehensive collection features hundreds of thousands of items related to play, including board games, books, video games, dolls, toys, electronic games, and other historical materials. Recent acquisitions to The Strong’s collections include the Scott Adams Adventure International Collection, which features an assemblage of rare games, magazines, marketing materials, photographs, and printed source code, all relating to the early computer game industry. Another addition to the collection is that of the Nutting Associates Collection, which showcases various materials relating to the manufacturer of the first commercial arcade video game, Computer Space, such as a company scrapbook, several unique photographs, and company records. The third new acquisition includes the Carol Shaw Collection and features materials and items that highlight Shaw’s career at Activision and Atari, Inc., and her significant contribution to the gaming industry, ranging from design documents, flyers, printed source codes, video game packaging, and game commercials. The Museum features exhibits that interpret the critical elements of play through new and recognizable displays such as the Berenstain Bears, Sesame Street, the Dancing Wings Butterfly Garden Reading, and Reading Adventureland. The Museums exhibits are themed around children's lifestyles and feature well-known characters and topics from comic books, storybooks, video games and television shows, as well as carousel and train rides, nature-related adventures and educational themes. Other exhibits include Academy of Interactive Arts and Sciences, America at Play, American Comic Book Heroes: The Battle of Good vs. Evil, Aquariums, Build, Drive, Go, DanceLab, Dancing Wings Butterfly Garden, Discovery Garden, One History Place, Pinball Playfields, Teenage Mutant Ninja Turtles: Secrets of the Sewer, and more. The Strong National Museum of Play offers an array of educational programs for children of all ages, including the Woodbury School which gives Reggio Emilia-inspired early kindergarten and pre-school programs. Other educational initiatives and programs include theme days, field trips, scout days, video game creation workshops, college and university programs, and professional development workshops for educators. The Strong National Museum of Play is located at 1 Manhattan Square Drive in Rochester, New York and is open to the public Monday through Saturday from 10:00 am to 5:00 pm, and on Sundays from 12h00 pm to 5:00 pm.The Strong offers a variety of dining options, ranging from Pizza Hut® Express and Subway™ to Taco Bell® Express and Bill Gray’s Restaurant in the vintage-style Skyliner Diner. There are also vending machines in the food court that offer a variety of healthy meals and snacks. The Museum shop sells a range of Puzzles, crafts, educational games, books, toys, souvenirs, and gifts.